Before I was married I traveled all around the U.S and world with my family and by myself. I never even hesitated once when getting on a car, train, bus or plane. (Well maybe sometimes) I was usually excited and couldn't wait to go on a new adventure. I even lived in Israel for a year and honestly felt so safe there. After I was married I would ache to go travel somewhere. It was in my blood. I longed to go to new places and meet new people. Over the years I have found contentment in where God has placed me and have become more of a homebody. I would love to travel again someday God willing, but right now I love being with my family in our snug little home. Recently I had the opportunity to go visit one of my best friends who lives in Georgia. Her sister contacted me and told me she wanted to surprise my friend with a girls weekend and wanted me to come also and surprise her! How fun! I didn't think I would be able to go because of funds and my husband's work schedule but somehow it all worked out. I knew I needed to take advantage of this open door. Who knew when I would be able to get away like this again? But once I bought my ticket fear surged through me. 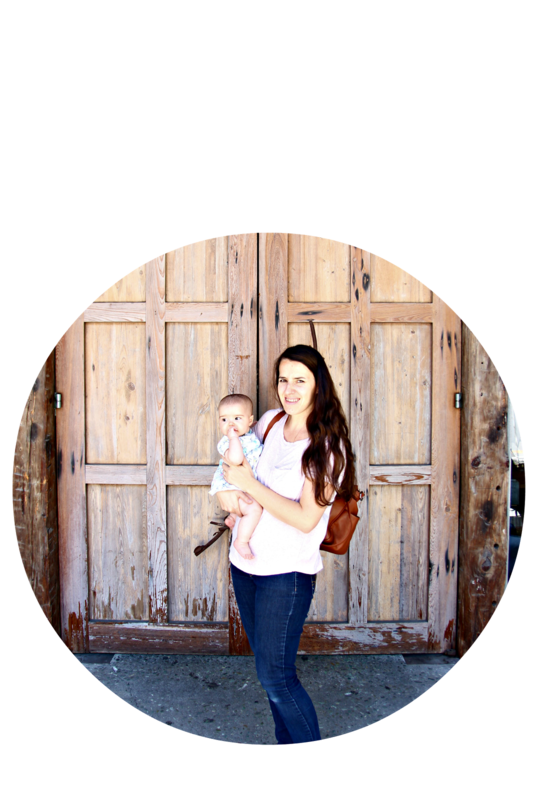 What if something happened to me( or the baby) while traveling? I shouldn't leave my family. We can't afford this right now. I should cancel my flight. I can't do this. I need to stay home with my family where it's safe. One bad scenario after another kept playing through my mind of what could go wrong. I imagined myself dying in a plane crash or terrorist bombing; leaving my husband with all the kids. Here I was finally able to go have a relaxing weekend with one of my best friends; something I have always dreamed of doing...and I was scared to death. I came very close to cancelling my flight, but I knew deep down that I could not give in to fear or else I would always be paralyzed by fear the rest of my life. There are times when we need to use extreme caution and be aware that of the danger around us; making wise decisions and being sensitive and obedient to God's leading. I knew though that in this case I needed to trust the Lord. I needed to face my mortality and know that wherever I am...I am safe in his hands. As I got ready to board the plane the song "No longer slaves" by Bethel came to my mind. I quickly downloaded it on to my phone. As we started to take off I played it. As I listened to the powerful lyrics and music tears streamed down my face. It doesn't matter if I am in the safety of my home or flying thousands of feet in the air...I am not going to die outside God's will and timing. I know that I will always remember that moment in my life when I chose to trust the Lord and not give in to fear. I had to admit that I was not in control of everything, but that he was. God revealed himself to me in such a powerful and personal way. I am so thankful how he is gentle with us in our fears and weaknesses. Though I am a christian it doesn't mean that I don't fear death. I am confident and secure in the hope that I have after death but that doesn't mean that I am not afraid of dying. I know beyond a shadow of a doubt when my heart stops beating and my soul leaves my body that I will immediately be with the Lord and I will never know fear, death, sickness, pain, sin and tears anymore. I know it will be glorious beyond what I can hope or imagine. But until then I have to live in my flawed, sinful, mortal body. I have to face the knowledge that I or my loved ones could die any day. I know my life won't be without fear, but I don't have to live in fear. I can trust that my Savior will not only take me safely to my heavenly home but I can trust that he will keep me safe here on earth until his preordained time for me to leave it. 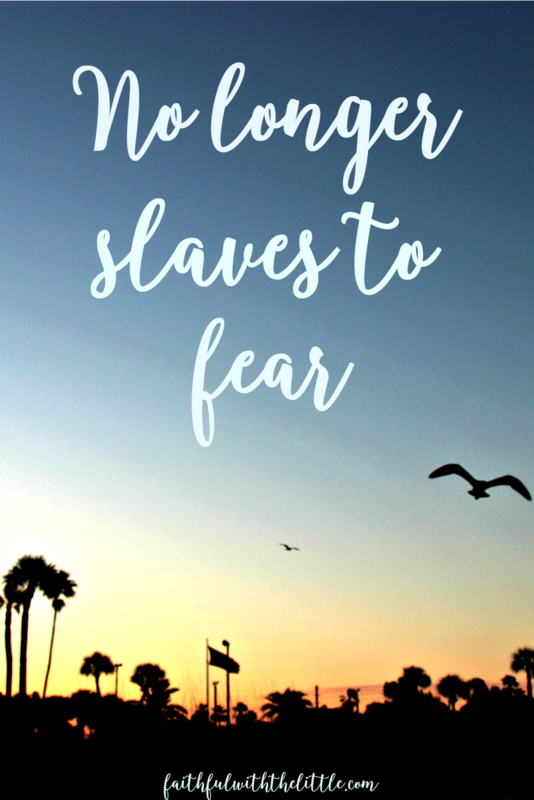 Are you bound by fear? Do you imagine terrible things happening to you and your family? Know that you are not alone, and that you don't have to live in fear. You can trust the perfect one who made you. No matter what situation or circumstances you face; God is ultimately in control. Whatever the outcome; whether good or bad we can trust his sovereign will. His ways are far above our ways. He sees far beyond what we can and knows what is best for us. Even if it does mean death or sickness. Of course while I was gone there were the horrific shootings in Orlando at the gay nightclub and of the beautiful and talented Christian singer Christina Grimmie. ( Who was killed by someone from my hometown:( SO SAD AND POINTLESS!!! Despite these terrible and fearful times, I ended up having a great time with my friend. I was so blessed to go to my friend's church and guess what? They played "No longer slaves"!! I just love when God confirms his truth to me! And you know what? I made it safely back to my family. I still was looking around the airport for suspicious characters and tried to avoid crowds but I put one foot in front of the other and didn't let fear overcome me. We live in an evil and sinful world. There is no way that we are going to be able to hide from it. But we can trust the one who is making all things new. Whatever fear you are facing I pray that you will not give into those but rather give them to the one who holds our lives in his hands! I want to leave you with this beautiful and powerful song. I pray it ministers to you as it did to me. Oh that would me worry too Karen! Yes, that scripture has been running through my mind also. GOd is way more able than we are to take care of our loved ones! I need to hear this everyday, but especially today. So often, the fear of losing my family tries to take me captive. Those lyrics are so powerful and I will repeat them in my mind today: I'm no longer a slave to fear; I am a child of GOD! Me too! It's so easy to give in to fear, we have to take hold of God's promises every day! It's so easy to let fear take hold and have a snowball effect on us. Wow, earthquakes are so scary. It's only by trusting in the one who holds this earth in his hands that we can find peace. Yes, God is so much bigger! Oh sister...this spoke to my heart. I've been grappling with fear lately. Fear of starting a new blog, fear of a new position at work, fear about a call from my doctor's office, etc. This song moved me. Thank you so much for posting! I am so glad GOd used this to encourage you! It's so easy to give into fear. I'll be praying for you! Thank you so much for sharing this at 100HappyDays. I'm choosing it to be featured on Thursday at http://www.cordof6.com/100-happy-days-37/. I related to this post SO much. I've been working all year to face my fear of traveling. I've never taken a flight by myself, but I know one day that will be the next step I take. Nice to meet you Rebekah! I totally get this- I was pretty fearless about many things that intimidate people, like travel, when I was younger. As I got older I began to recognize the possibilities for harm and evil in those situations and fear got a grip on me, too. Praise the Lord we do not have to be slaves to it! Thanks for the reminder and song! You too Bethany! Yes, so thankful for God's freedom and grace! Hi, I am visiting from Faith Filled Fridays. Thanks for sharing! I absolutely LOVE your site design. The flowers and font are perfect together.